I thought I'd exhausted all the answers the Comichron database potentially had on Watchmen questions — but this week is throwing some curveballs. I've had several requests in the last few days for information about the Charlton super-hero titles from the 1960s, specifically the characters that were the partial inspiration for the Watchmen. The challenge here is that Charlton comics circulated in fewer numbers than those of almost any other publisher that filed circulation statements in the 1960s; check out the rankings from the individual years, and you can see how far down they rank. And while I have Statements of Ownership from at least 34 different Charlton series — ranging from Fightin' Army to Sick to Teen-Age Love — not many have been turned up for the super-hero titles as yet. 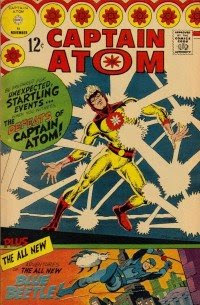 Of the five major Charlton players related to Watchmen, about the only data I have relates to one character: Captain Atom, the precursor to Doctor Manhattan. But it's spread across two — or three — titles, depending on how you look at it. 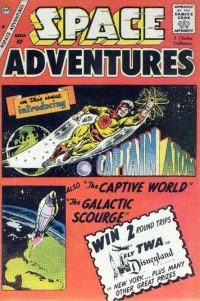 Captain Atom debuted in Space Adventures #33, the March 1960 issue — and we can see from the partial results reported on the Space Adventures page that that issue probably sold an anemic 110,000 copies, a ninth as much as the best-selling title of 1960, Uncle Scrooge. Charlton's market penetration was simply too poor, then and forever: We know from the market shares for 1959 suggested by the Ayer Directory that its market share was less than 10%. Charlton cited sales of 2.5 million copies monthly in that year — and its slate was large enough that nothing under that umbrella was probably doing better than 150,000. Looking at the non-hero books I have info on, I rather doubt that any Charlton book topped 200,000 in the 1960s at all — not until The Flintstones, which Charlton inherited from Gold Key. Blue Beetle's third try did feature Ditko's The Question, the precursor to Rorschach — but again, there were no Statements in that title. That leaves, from Watchmen, Comedian's inspiration, Peacemaker: while Statements have been found in Space War and Fightin' Five, the title it became, none have been reported to me from issues after #40, when Peacemaker debuted. And finally, Ozymandias' antecedent, Peter Cannon, Thunderbolt; I have no Statements at all from that title, or its precursors, Mysteries of Unexplored Worlds and Son of Vulcan (the latter's two-issue stint notable for including Roy Thomas' first professional work, according to Overstreet). So a lot of blanks yet to be filled in — which readers with clear scans of Statements can do by using the jjm [AT] comichron address. But I doubt anyone will answer the greatest mystery of all: Why did Charlton even bother with a Second-Class Mailing permit, when it sold so few subscriptions? Unusual Tales had 11 subscribers in 1963 — and 14 in 1964 — and the other books weren't much better. Was their subscription agent in the Witness Protection Program? Addition: I'm not the only one whose thoughts have turned to Charlton; check out this interesting history of the firm here. The history starts with "The two founders of Charlton Comics met in a New Haven County jail cell 1934" — and goes from there! GoogleTrends and webcomics: Why the disconnect?